So I was at Borders a few days ago, trying to find something on which I could blow my 33%-off coupon, when I spotted a display of Tru Blood bottles. 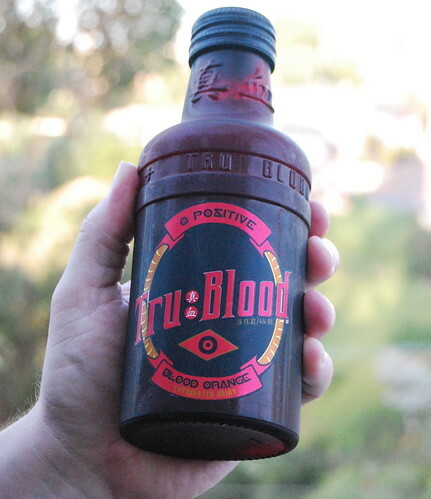 Because, you know, when you think “carbonated fake-blood beverage based on the HBO series ‘True Blood,’” you think “Borders Books and Music.” I had a sample of Tru Blood at WonderCon this year and I recalled it being a tasty concoction, so I bought a bottle. 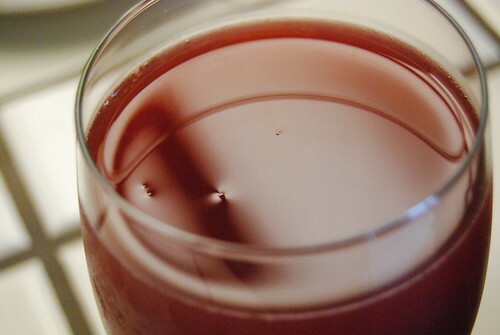 Last weekend marked the season finale of “True Blood,” the genesis for this fictional beverage. In the series, Tru Blood is an artificial blood that nourishes vampires. Like Ensure™ with coagulants. Luckily, the boutique soda does not. Coagulate. The real Tru Blood Type O Positive is actually a blood orange soda with a very light fizz. Its flavor is both sweet and a little tart. Which is hilarious to write, because the nose — if you can describe a soda as a wine — smells just like a chewy SweetTart, or even a Pixie Stix. The bottle is a nice marketing endeavor. Not only does it look like the Tru Blood on the HBO series, but the glass of the bottle itself is a deep red with kanji characters molded onto the neck (an homage to the show; if I recall correctly, the Japanese created the synthetic food/beverage). Ingredient-wise, there are a few pleasant surprises. Like the best sodas, this baby is made with cane sugar instead of high-fructose corn syrup. It also has some caffeine, which makes sense to me. And it has 99 calories for 14 ounces, which is a lot fewer calories than most 12oz. sodas. I would recommend trying a bottle, but really only if you’re a soda snob and/or if you’re a fangbanger (fan of “True Blood”). At $5.99 plus tax and CA redemption, it’s certainly at the bottom of my shopping list when I think “refreshing soda for a hot summer day.” Especially since Tru Blood is supposed to be served at 98.6° F. Of course. yeah, i remember seeing those last year somewhere. overpriced. they would look really cool as a prop for a halloween outfit – you know, a merlotte’s waitress or as a vamp! not that i’d dress up as a merlotte’s waitress tho’! ha ha. omg – eric in the finale! even with cement all over him, he still looked quite hawt! I am split between Eric and Bill. Admittedly tho, Bill looks tiny next to Eric.